“A cat just walked over my grave..."
Val Lewton never directed a single film, which may come as a surprise considering his stature in American cinema in general and the horror genre more specifically. Even his writing credits are sparse, as he only penned three movies in a career that was sadly cut down by a heart attack when he was only 46 years old. 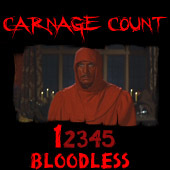 His legacy is instead tied to the set of low-rent horror films he produced for RKO over the course of four scant years in the 40s. That he endures as a mere producer perhaps isn’t that unheard of, as that role actually carried more artistic clout then and their names often overshadowed directors’ on the marquee. 1942’s Cat People is the film that would begin to define Lewton’s career--in fact, it’s possible he wouldn’t have had one without it. And in many ways, it’s completely emblematic of his all too brief run, as it’s basic, cheap pulp material that he essentially plucked from Poverty Row and dropped it right into the middle of Hollywood Boulevard. Simone Simon is Irena Dubrovna, a young Serbian woman who bumps into Oliver Reed (Kent Smith) one day at the zoo. The two begin to fall in love, despite the odd events surrounding Irena, such as the bizarre behavior of animals in her presence. She also holds some strange beliefs; for example, she insists that she’s descended from a race of wicked, cursed Serbs that escaped the persecution of an ancient king. Because of this, she believes she may turn into a wild panther if fully aroused. This would send most guys running for the hills, but Oliver is brave enough to marry her; however, he’s obviously got more guts than brains because he begins to confide in his secretary (Jane Randolph), which only accelerates the cattiness. I suppose if you were RKO in ‘42, this is exactly the type of movie you’d make to counter Universal’s monumental Wolf Man from the previous year. Lacking just about everything that production boasted--star power, high quality effects work, and a budget--Cat People instead relies on the grand vision of Lewton and director Jacques Tourneur, who almost literally craft something out of nothing. Its plot is threadbare and swift, clocking in at only 73 minutes, revealing its short story origins (which was written by Lewton itself). Even most of its horrors are completely implied and don’t even show up in proper fashion until the very end of the picture. Up until that point, Cat People broods and simmers with the overwhelming notion that something terrible is destined to happen. From the moment Irena discards an ominous sketch of panther being impaled by a sword, we feel a suffocating sense of doom. Tourneur masterfully sees this through with breathtaking shadow play and ominous lighting. Resembling the stylings of film noir (which only just beginning to burgeon in full), Cat People is a gorgeously polished bit of gloominess. As so much of the terror is unseen, the tense atmospherics stoke the fires. Structurally, it’s a perfectly paced horror film, as the narrative is punctuated by subtle weirdness that hints of something being amiss. Eventually, we make our way to a full-blown stalking scene that sees Randolph being followed by something out in the mist-shrouded streets--or maybe not. Either way, the film ramps up and shrieks here, climaxing in an early example of a false scare, which Cat People apparently helped to pioneer (how fitting is it that false scares often involve a cat?). Narratively, the film somewhat echoes those noir pictures; a dark woman is certainly at the center of the script, as is a deep mystery. They happen to be one in the same, though Simon is certainly just as sympathetic as she is enigmatic. It’d be easy to equate the classically tortured Irena with a character like Larry Talbot, but she’s a bit more anxious, sad, and marked by an Eastern European exoticism that keeps her at arm’s reach. We know Talbot was repentant, having been overtaken by a force beyond his control, as we live through the cycle of the wolf with him. In Irene’s case, everything is building towards that revelatory moment, and her obvious pent up frustrations make her seem dangerous. One can hardly blame her, as she’s surrounded by an aloof, almost indifferent husband and his new mistress. Her psychologist (Tom Conway) offers little comfort outside of treating her like he would any hysterical woman; in fact, he even begins to aid and condone Oliver’s illicit affair, going so far as to work out the logistics of a divorce. Even talking about such things reveals Lewton’s maverick approach; often seeing the Production Code as more of a suggestion rather than steadfast rules, he would constantly push the envelope with edgy content (which arguably climaxed in The 7th Victim, whose ending is completely ballsy for the era). With Cat People, we not only see this in the mere presence of the word “divorce” (which was practically treated as a curse word by the Catholic decency leagues hell-bent on preserving Americana on the screen), but also in the film’s simmering sexuality. Arousal is very much at the center of the film; in fact, it’s practically driving the plot. Distilled to its simplest terms, Cat People is about the fear of that feminine sexuality boiling over. Irena is afraid of this herself, but perhaps only because she’s been conditioned to be so; considering her antagonists exhibit prehistoric notions of sexuality and mental illness in women, it’s easy to read this as a subversion of the sexual politics of the age. As is the case in many feminist texts, the villains here are men who are quick to diagnose and rid themselves of this hysterical woman; sure, Oliver at some point mentions that he should do the right thing and continue to care for Irena, but his sincerity is doubtful. And while the film definitely works as razor sharp pulp, Cat People feels more engrossing due to the subtexts rumbling just beneath its horrors. It’s might be quaintly spooky these days from that standpoint, but it’s still difficult to deny the powerful tragedy underpinning this story. Irena is the most sincere individual to be found here, and it’s unfair that she’s been cursed by her impending transformation into a hideous beast. However, it’s even more unfair that she’s forced to endure the sideways glances and indignities of infidelity. This sometimes feels like it should be a story of karmic comeuppance, but we’re even denied that, as Irena’s impending transformation isn’t any sort of triumph. Instead, it’s just the sorrowful crescendo to a sad tone whose final notes tell us what we already knew all along: that she never lied about a thing, even though her claims were outrageous. 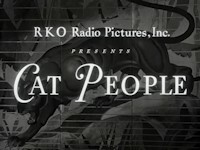 Cat People was a massive hit for RKO in 1942; in fact, it was so lucrative that it warranted a sequel a couple of years later, Curse of the Cat People. For Lewton, it marked his arrival and allowed him to craft further tales of terror in a run that yielded the likes of I Walked with A Zombie, The Body Snatcher, and the aforementioned 7th Victim, all of which are landmark genre titles for the 40s. Warner Brothers collected those and more in the Val Lewton DVD collection, which is a must own for any horror fan. Cat People comes housed on a double feature disc (accompanied, of course, by its sequel) that contains a high quality presentation. Featuring the correct full frame aspect ratio, the transfer is a faithful reproduction of the film’s remarkable lighting and contrasts, while the mono soundtrack balances the dialogue with Roy Webb’s eerie score. Supplementing the features are commentaries by film historian Greg Mank, an audio interview with Simon, and the theatrical trailers for each movie. Though you can purchase this disc separately, the box set is preferable, as it also includes the documentary Shadows in the Dark, which chronicles Lewton’s career. Having seen them all, I can say it’s hard to go wrong with any of them, but Cat People is a good starting point. Essential!